ISTANBUL (AFP) – Ten people were killed and more than 70 injured on Sunday (July 8) when a train packed with weekend passengers derailed in northwest Turkey, the health ministry said. The train, with over 360 people on board, was travelling from the Edirne region on the Greek and Bulgarian borders to Istanbul’s Halkali station when six of its carriages derailed in the Tekirdag region. “According to initial findings, 10 people lost their lives and 73 people were injured,” Health Ministry Undersecretary Eyup Gumus told state-run news agency Anadolu. He also told local media more than 100 ambulances have been sent to the scene. The Turkish army said in a statement that it had sent helicopters to the scene, while the Istanbul municipality on Twitter said 24 rescue workers and six rescue vehicles were on their way to provide assistance. The first television pictures showed several train carriages laying on their sides, and shocked injured being taken away on stretchers as rescue workers picked through the wreckage. “The accident happened because of adverse weather conditions,” Tekirdag governor Mehmet Ceylan told the NTV channel. Reports said the surrounding area was muddy due to recent rains. The transport ministry in a statement said officials confirmed that because of heavy rains, the ground beneath the rails subsided away, causing the train to derail. Transport Minister Ahmet Arslan was on his way to the scene, the ministry added. 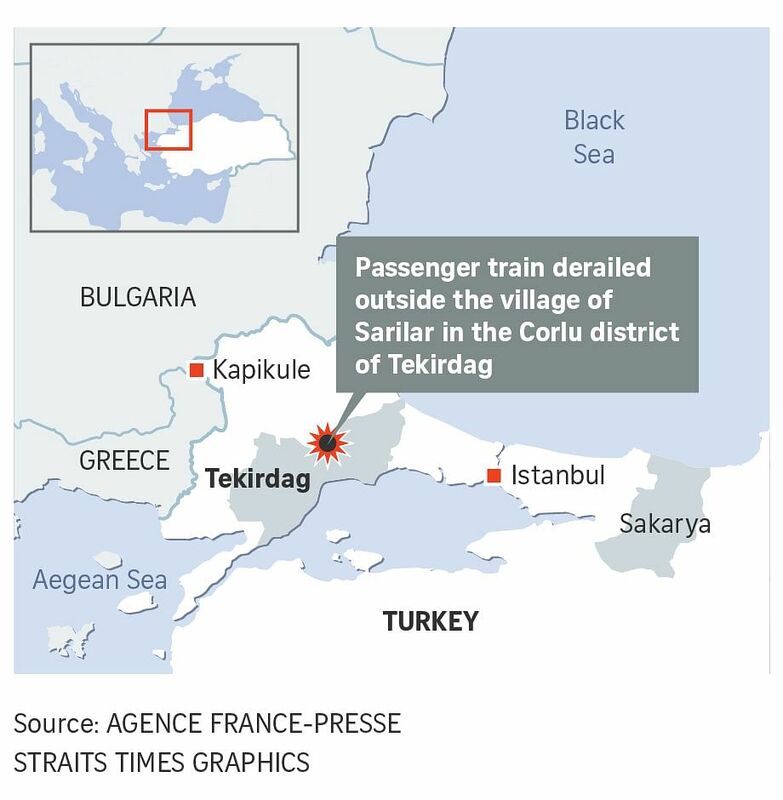 The train derailed outside the village of Sarilar in the Corlu district of Tekirdag, reports said. President Recep Tayyip Erdogan expressed his condolences over those who lost their lives in the accident that has “deeply upset the whole nation”. Erdogan said all state institutions were “using every means available to help” in a statement issued by the presidency, as he vowed that there would be a comprehensive investigation into the “tragic accident”. Turkey’s audiovisual authority RTUK later said the government has issued a temporary ban on broadcasting images from the scene. Turkish authorities under Erdogan have over the last years sought to modernise Turkey’s once ramshackle rail network, building several high speed inter-city lines. Turkish passengers have in general preferred taking planes or the bus for inter-city travel but this is changing with the new high-speed lines. The train involved in the accident appeared to be one of the slower passenger trains travelling on a single track railway. Turkey’s rail network has been hit by several fatal accidents over the last years. In January 2008, nine people were killed when a train derailed in the Kutahya region south of Istanbul due to faulty rails. And in Turkey’s worst recent rail disaster, 41 people were killed and 80 injured in July 2004 when a high-speed train derailed in the northwestern province of Sakarya.